I’m rarely captivated by art outside of painting, which means I usually cherry-pick my way through a tour of New York City shows. 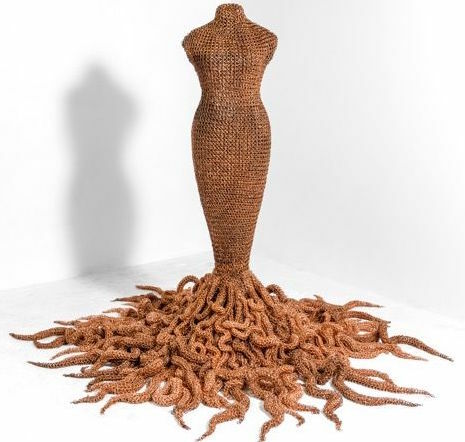 A few memorable exceptions would be Terrence Koh’s kneeling crawl around a cone of salt a few years ago at Mary Boone, and the spectacle of Kara Walker’s Sugar Baby. More powerfully than either of those, Susie MacMurray’s work won me over immediately in her 2013 show at Danese Corey. Her work’s metaphoric power seems secondary to its formal originality. It’s conceptually anchored but its impact doesn’t depend on the meaning you extract from it. Most of her work looks unstrained and almost natural. 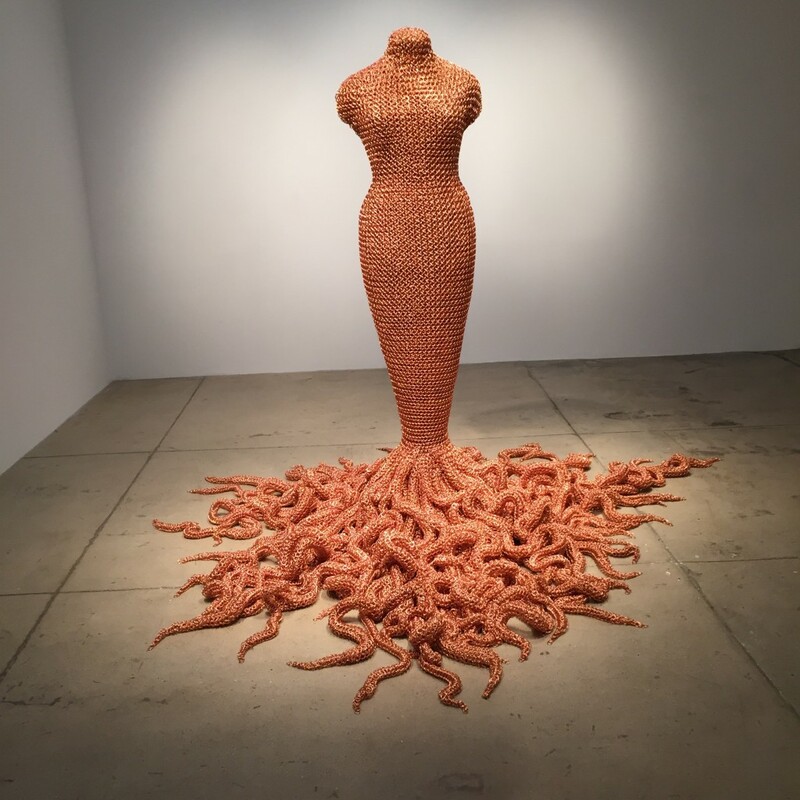 In her current show at Danese Corey, Hinterland, what would have caused injury, in its original form, has been disarmed, and, in turn, is disarming, drawing you toward it rather than pushing you away, as it was originally meant to do: snakes, sniper shells, barbed wire, all become alluring, if only as objects of curiosity, but nearly as often because they’ve become beautiful in the new context she gives them. Her craving for simplicity and unity gives her innovative forms the feel of fresh archetypes, metaphors that attract interpretations rather than assert or contain a fixed meaning. Mythology has that quality, and she echoes a couple Greek tales in this show: Pandora and Medusa. A short video at thenextrembrandt shows you how researchers created a very convincing forgery, a “new Rembrandt”, using advanced software and data mining to guide a 3-D printer that actually creates a topography of peaks and valleys in the print’s surface to imitate layering of paint. If an artist’s style can effectively be impersonated by artificial intelligence, does that mean a perfect, computer-generated art forgery could essentially convey everything an actual Rembrandt would? 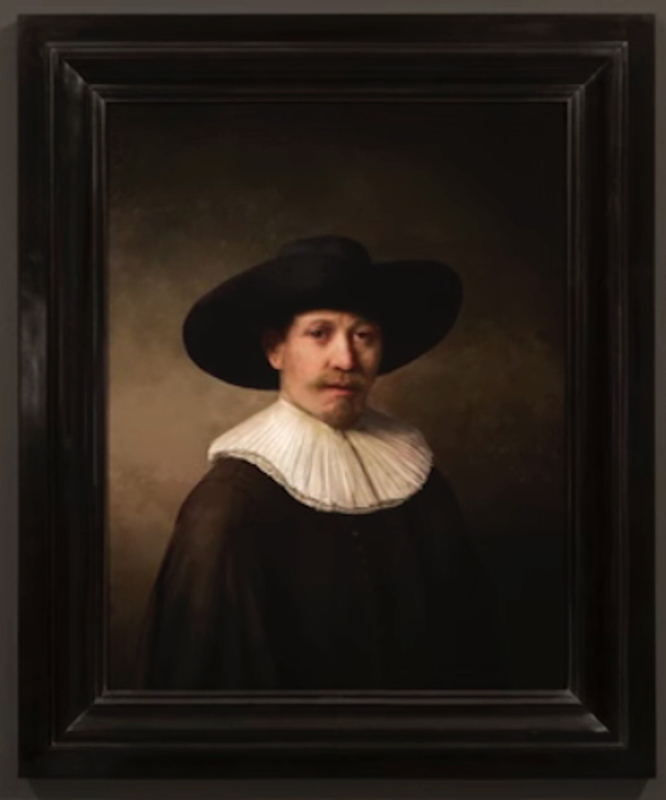 In other words, if if passed some kind of critical equivalent of the Turing test by fooling an authenticator and essentially creating a work of art indistinguishable from those of the artist being impersonated–is it virtually the same as an original Rembrandt? If it were possible to generate new works of art this way in the style of your favorite artist, what would happen to the value of the holdings among those who crave art the way the Hunt brothers craved silver? Nothing, probably. The original would still be what it is. I wouldn’t mind having an exact duplicate of my favorite Braque or Matisse or Van Gogh, down to the physical texture of the paint on the surface, for whatever one of these would cost. In this case, it’s still ink, paint-based or not. How long before they can build one of these using actual paint? Artificial intelligence marches on, for better or worse. Susie MacMurray is back with another solo show, Hinterland, at Danese Corey. I plan to be there for the opening reception next week and hope to talk with her in person about the new work, which arrives less than three years after her last solo show in Chelsea. From this distance, it looks like another knockout. I’m eager to see it up close. 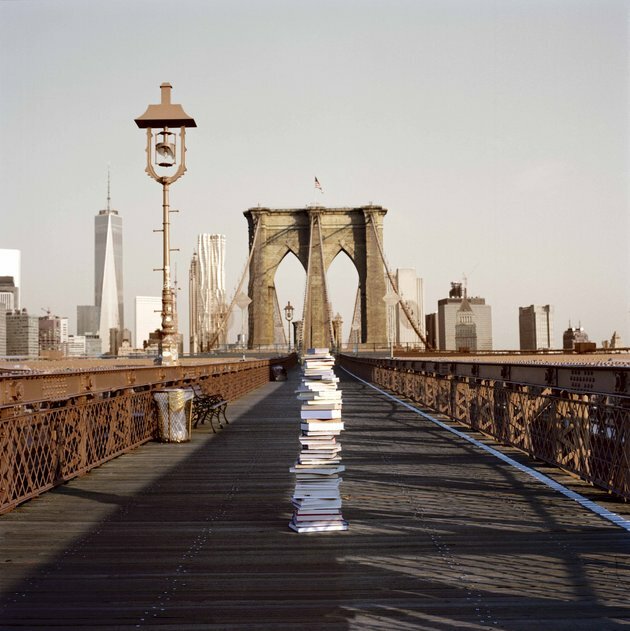 Symmetrical book stacking. If you feel the need to call Ghostbusters, call Bill himself and leave a message, not the new crew. His 800 number is out there somewhere. but Peter Venkman’s irony in the New York Public Library–“No human being would stack books like this”–wouldn’t apply here. It’s a stack of books that works like a blog post–except I can’t imagine it will stick around for long. I wonder how long blog posts will last? You are currently browsing the represent weblog archives for the month April, 2016.